After a lovely vacation in Prerow we are back full of energy and completely relaxed. I am also looking forward to continuing the German bread series, started a few weeks ago. 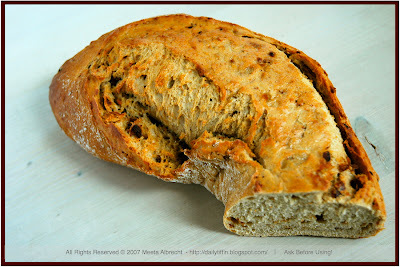 Today I am featuring a wonderful and exceptionally flavorful bread. The onion ring. When you buy the bread from the baker it comes in a ring and looks like the letter "O". As you can see from the pictures I could not take a picture of the whole ring because as soon as I come home with it, the aroma of this bread brings both my boys to the kitchen. Then the bread is sliced and spread with butter and enjoyed with this simple pleasure. The onion ring is made of wholewheat flour and a mixture of slowly roasted onions and herbs. It took me a while to coax the recipe for this one from my baker - he did not reveal everything - but I hope the recipe I provide below is one that comes very close to it. 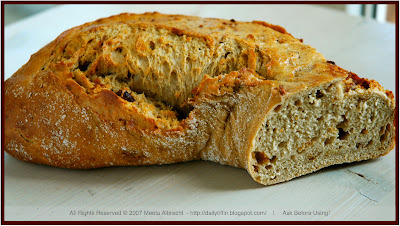 We often buy this bread when we are craving for something wonderfully savory or have a BBQ party coming up. It's always a huge hit with our guests and a brilliant alternative to the ordinary baguette. It normally does not happen, but if we do have any leftovers of this bread, I love making bruschetta with it. 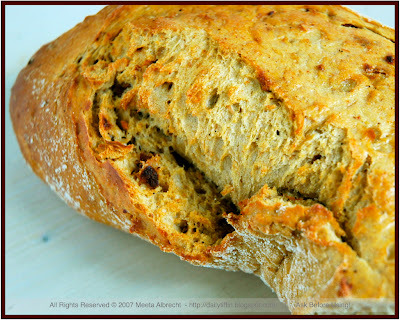 After a day or so, I find this bread tastes more intensively of the onions and therefore works incredibly well when combined with roasted vegetables and toasted. My favorite kind of Bruchetta is a delicious recipe from Jamie's Italy by Jamie Oliver - Aubergine and Mint Bruschetta. Hope you enjoy both the recipes. In a pan heat the butter and gently sauté the onions until browned and caramelized. Sprinkle the herbs and allow to cool. In a large mixing bowl add the flour and make a well in the middle of it. Mix the yeast in 1/8 l of luke warm water and then pour into the well. Sprinkle with a bit of flour. Covered with a damp tea towel place the bowl in a warm place for 15 minutes. Add the salt in the remaining water and then pour this into the dough. Add the onion-herb mixture. Knead to incorporate the ingredients. Once you have a smooth dough, form the dough into a ball and scatter some flour. Put the ball of dough back into the bowl and allow to rise covered with a damp tea towel in a warm place - about 30-40 minutes. The dough should have doubled in size. Place the dough on your kitchen counter and start kneading. Knead for a few minutes, then form either a ring, by rolling the dough into a"snake-like" form and then joining the ends together to form an "O", or simply form a longish loaf out of it. On a greased baking tray place the onion loaf and allow to rise for another 15 minutes. Then brush the top of the loaf with some water, sprinkle some flour and bake for a good 40 minutes. If you have any leftover the next day, make these lovely snacks for dinner. Heat a grill pan and place the aubergine slices next to each other. When they have nicely grilled on both sides and are a golden color remove them from the pan and place them in a bowl. In the meantime in another bowl mix together a 3 tablespoons of vinegar and 8 tablespoons of olive oil with the parsley, mint and the garlic. Salt and pepper to taste. Pour the vinaigrette over the grilled aubergine slices and allow to marinate for a few minutes. Cut slices of your onion bread and grill these in your grill pan. Rub the halved garlic clove onto the toasted slice of bread. Sprinkle with a dash of olive oil. To assemble your bruschetta place the aubergine mixture of the toasted bread and press down so that the aromas of the mixture get soaked into the bread. This Post was written by Meeta from What's For Lunch, Honey? i think herr becker added some gluten plus some other flour (atleast 30% of another flour) 'cos if this a 100 wholewheat flour reipe, it will be too dense, and one long rise is not enough. he's a crafty one to not tell you what else is in the recipe, lol. I may not try making the bread, but the bruschetta sounds great. Never tried eggplants on bread. Hi Bee, Actually I used what Herr Becker told me about the recipe and combined it with another recipe I have from a German bread baking cookbook. So, it is not 100% Herr Becker's onion ring. Herr Becker for example does not use herbs in his bread but in the cookbook I thought that was a nice addition. True that the ring from Herr Becker has rye flour too which would be a great addition. Suganya, Aubergine on bread is great we often use it on pita bread too or make a aubergine salsa which also goes fantastically with this bread. Meeta, the onion ring looks very inviting. Would like to try it for sure. that bruschetta sounds wonderful meeta, i'll have to give it a try! This is excellent! Great recipes, beautiful pictures, fun, practical ideas for portable food. I'm sure that I've only scratched the surface, so I'll be back! I tracked over here from Tartelette; not only is she skilled, but seemingly very well-connected! Nirmala, thank you hope you let us know how it tasted. Abby - it is. I am a huge aubergine fan so this is so perfect! Glenn - welcome to the Daily Tiffin. Hope you enjoy your stay here. Helene is the best isn't she? Meeta, I have always wanted to bake some bread on my own... ever since my best friend bought a bread maker and started sending me pics of her bread. This seems so tempting. Tiffin Tuesday - It's all about colours!